This year is being rather strange, with so many things to do that I tend to neglect the blog, but at least NOT the knitting. We have been around again, and are about to leave again, though for a short while. 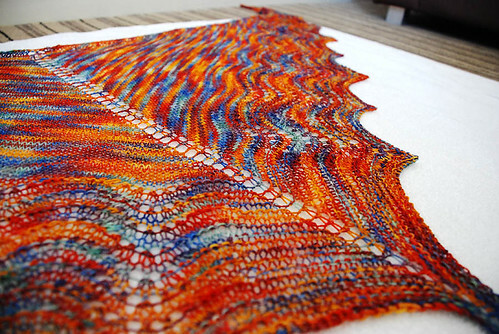 This year I have again decided to play with the 12shawlsforever group on ravelry, that is to knit 12 shawls over a year. And I'm keeping up with it quite well, with almost a shawl every month. 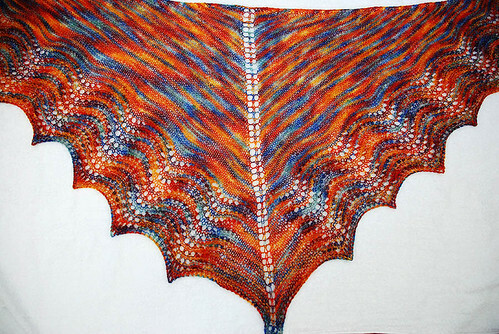 First shawl to be campleted was multnomah, a pattern I saved ages ago wanting to make it as soon as possible, and so here it is! If you want to make one, go here at helloknitty to download the pattern: there are many more, and they are all great. I used a wool I bought at Melbourne crafts market, from Hawthorne Cottage, with a very vibrant color: I love it! The shawl is gone to a very good friend, who will use it a lot now that winter is coming there!